After a few-decade stint in Saudi Arabia, and some adventures in other parts of the world, my grandparents had amassed a collection of some of the most beautiful textiles and objects I’ve ever seen. From Persian rugs collected during the 70s in Iran, to beautiful etched brass tea sets and poufs bought in my grandma’s native Morocco, these treasures were displayed all over the home where they settled in a San Diego suburb. Once in a while my parents would drive my brothers and I over to visit, and truthfully, most of what they had seemed to me like part of a larger background of “stuff”; the average American living room…except for the resplendent peacock chair in the corner. I don’t recall any strong feelings toward my grandparents’ peacock chair, or any desire to “thrift” it from them. Actually I didn’t really care at all, about thrifting or interior design, or furniture, and I wonder at my indifference now as I covet that chair and other pieces in that house like crazy! 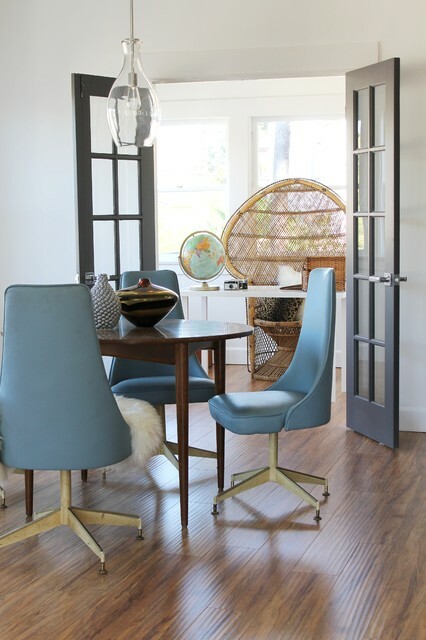 Throwing a peacock into your mix of dining chairs is the perfect way to add a regal bohemian or vintage element to your dining room. In the first case, a simple wicker peacock chair makes a lovely addition to its glam, modern space. Nothing says “I’m the boss” like sitting on a chic wicker throne behind your home office desk or cubicle (if you manage to sneak one in). The organic design of a peacock chair offers ideal contrast to an otherwise sterile workspace or conventional office! Peacock chairs–especially double peacocks–offer the most romantic seating option at a wedding, in my bohemian opinion. Use them as seating for the bride and groom or scatter them throughout the reception and dinner tables for guests. Peacocks are the ideal chair for the outdoors with their durable wicker/rattan frames. Luckily, these chairs are a marriage of beautiful boho form and function and look just gorgeous as loungers in a courtyard or patio. One of my favorite examples of wicker peacock chairs in decor, this particular home has created a corner vignette with TWO of them, and an ottoman and small side table in between. I’ve sat in a rather large peacock chair with my laptop at work, and it felt as though my screen was protected by the large fan behind me (not that I was doing anything but work of course! *wink*). I imagine this phenomenon would be similar during a party, when two friends (or strangers) are looking to have a private conversation away from the rest of the crowd. Also, how lovely does an early morning cup of coffee with a friend or spouse while sitting in these chairs sound? Waking up to one of these chic wicker chairs in the corner of my bedroom is definitely #bedroomgoals. Adding a pillow and a throw would offer the perfect mix of cozy and vintage. You may need a wider seat, but designing your nursery with a pillow filled peacock chair–and a pouf to kick up your feet–will offer both a comfortable seat for you and your baby, and a unique boho/vintage design element for their first room. Start fueling those bohemian dreams while they’re young! Have you designed space or event with a peacock chair?